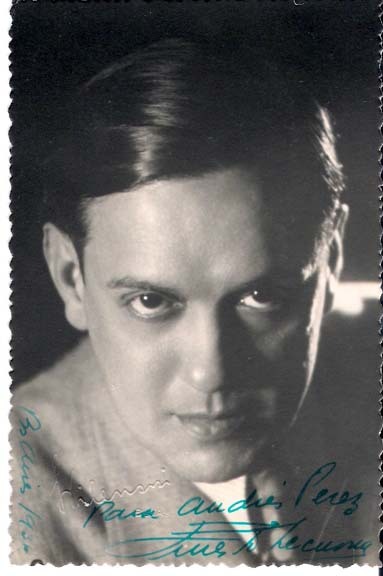 Ernesto Lecuona (1896-1963). Cuban Composer. Uncommon, Rare Vintage Photograph Signed, being a postcard sized image, 4 in. by 6 in., with a photographer's imprint on the surface and rubber stamp imprint on verso marked Buenos Aires. Close-up head and shoulders portrait staring intensely into the camera. Inscribed on the lower margin in green, in Spanish: "Para Andres Perez, Ernesto Lecuona, B. Aries 1936."